Trump Denies Lying About Trade To Canadian PM - Joe.My.God. President Trump on Thursday insisted that the U.S. has a trade deficit with Canada after he reportedly acknowledged mentioning the deficit to Canadian Prime Minister Justin Trudeau in a meeting without knowing if it the claim was actually true. According to the U.S. Trade Representative’s office, the U.S. runs a $24.6 billion services trade surplus with Canada and a $12.1 billion deficit on goods. That means that the U.S. ultimately runs a $12.5 billion goods and services trade surplus with Canada. We do have a Trade Deficit with Canada, as we do with almost all countries (some of them massive). 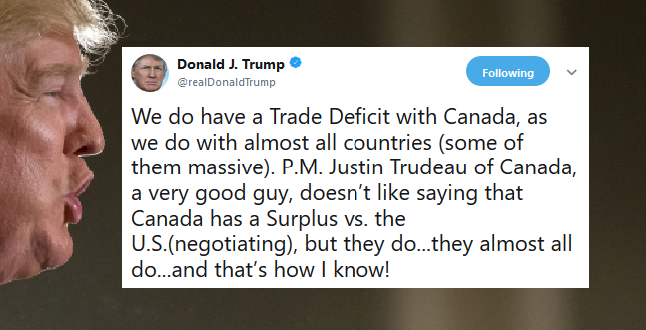 P.M. Justin Trudeau of Canada, a very good guy, doesn’t like saying that Canada has a Surplus vs. the U.S.(negotiating), but they do…they almost all do…and that’s how I know! Trump said Trudeau told him there was no trade deficit. Trump said he replied, ‘Wrong, Justin, you do.’ However, the Office of the United States Trade Representative says the United States has a trade surplus with Canada.